Grand l´Anse is just south of famous Grand Anse on La Digue. Don´t exchange these two, their name is pretty similar ;). 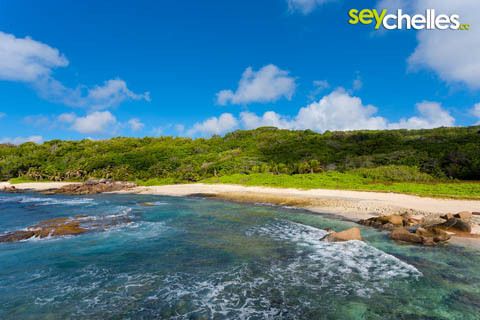 If at all, most people know it from passing by on their probably guided tour to Anse Marron. Other than that, hardly anybody ever finds his way here. Unfortunately, Grand l´Anse doesn´t offer much besides a scenic view. Swimming is close to impossible due to the many waves that crash against the rocks laying in this small bay. There isn´t really shade worth mentioning, so passing by, sitting down for a few minutes and continuing the walk is what most people do.